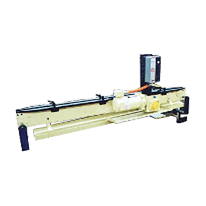 Model 1650 Conveyors for Centerless Grinding can handle a variety of sizes and shapes that require O.D. grinding. Loading is no problem. These Feedall’s can be designed to use load ramps, hopper feeders, dumpers and metering hoppers to add capacity and auto load your Feedall. Conveys steering racks from the workrest of a centerless grinder to the workrest of another centerless grinder. Racks will exit the first grinder and be conveyed into a transfer device. The transfer discharges the parts uphill and onto a rolling ramp. The parts exit the ramp onto an infeed ramp attached to an entrance conveyor. The conveyor conveys the parts into a pinch wheel device that aids the parts into the grinder.